27 by 37.4 cm., 10 ¾ by 14 ¾ in. This view is taken from the east looking over Sudeley Castle with the village of Winchcombe beyond. The earliest part of the castle was built by Ralph Boteler in the first half of the fifteenth century. He built the gateway, Portmare and Garderobe Towers, the church and the great barn. Edward IV gave the castle to his brother Richard and it was later the home of Katherine Parr, the last and surviving wife of Henry VIII. During the Civil War, Sudeley was a base for Charles I's nephew Prince Rupert, and, because of this, the Council of State in April 1649 ordered that the castle be 'slighted' or rendered unusable for military purposes. Accordingly, in August and September 1649, Sudeley was effectively demolished, roofs were removed and the buildings exposed to the elements. Much of the effects of the Cromwellian demolition can still be seen in Robins's view of more than a century later. Architectural fragments strew the ground, and the tall windows of the ruined Banqueting Hall (never in fact rebuilt) can clearly be seen in the centre of the composition. On the right, St Mary's Church is obviously roofless and in ruins. During the 19th century, some parts of the Castle were rebuilt for the Dent family, who had purchased it in 1837, and, thanks largely to George Gilbert Scott's work from 1854, Sudeley now presents a very different appearance from that recorded by Thomas Robins in the 18th century. In addition to the rebuilding of the outer Court and the western side of the Inner Court, St. Mary's Church and Katherine Parr's elaborate tomb were magnificently restored by Scott between 1858 and 1863. 22.2 by 26.3 cm., 8 ¾ by 10 ¼ in. This portrait of an unknown gentleman may be a view taken at Leckhampton near Cheltenham, Gloucestershire. As a portrait, it is almost unique in Robins’s work and is likely to be of a Gloucestershire landowner. Cathryn Spence has dated it to circa 1740-45. Thomas Robins was born at Charlton Kings near Cheltenham. Little is known of his early life but he was in Bath by 1760 where he established his reputation as a topographical artist producing views of the city and local grand houses. 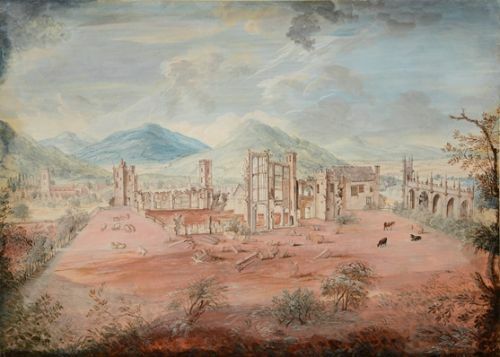 He returned to his home county drawing at least two panoramic views of the city of Cheltenham in 1748. One is in Cheltenham Art Gallery and another was sold at Christie’s on 5th June 2007, lot 32 for a hammer price of £26,000 (see John Harris, Gardens of Delight – The Rococo English Landscape of Thomas Robins the Elder, 1978, p.20, pls. 35 and 37). A view of Sandywell Park a few miles south of Sudeley, dated 30th September 1758 is in an album of drawings by Robins in the Victoria and Albert Museum. Works by Robins are rare – two views by him of Honington Hall were sold at Christie’s on 14th July 1987, lots 135 and 136 for £45,000 and £26,000 respectively. 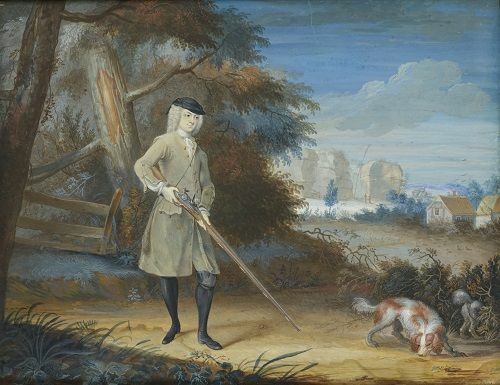 Robins’s importance is as one of the earliest topographical artists working on paper (or vellum), recording gardens and country houses from 1747 until the late 1760s when few others were doing so. His works are often drawn within a framework of painted intertwining rococo flowers. John Harris describes him as `an artist who painted English houses and garden when they were most enchanting; whose eye captured the rococo garden at its perfection and when it was most whimsical; whose paintings are almost sensual in the sheer delight they give; such was Thomas Robins the Elder’ (op. cit. above, p.1). We are grateful to John Harris and Cathryn Spence who is working on a catalogue raisonné on Robins, for confirming the attribution to Robins. Thomas Robins was born at Charlton Kings near Cheltenham, only six miles as the crow flies from Sudeley Castle. Little is known of his early life but he was in Bath by 1760 where he established his reputation as a topographical artist producing views of the city and local grand houses. He returned to his home county drawing at least two panoramic views of the city of Cheltenham in 1748. One is in Cheltenham Art Gallery and another was sold at Christie’s on 5th June 2007, lot 32 for a hammer price of £26,000 (see John Harris, Gardens of Delight – The Rococo English Landscape of Thomas Robins the Elder, 1978, p.20, pls. 35 and 37). A view of Sandywell Park a few miles south of Sudeley, dated 30th September 1758 is in an album of drawings by Robins in the Victoria and Albert Museum. Works by Robins are rare – two views by him of Honington Hall were sold at Christie’s on 14th July 1987, lots 135 and 136 for £45,000 and £26,000 respectively.